SIA AppChallenge is back for its 2018 edition! The team is on a hunt for the next generation to take ideas and innovation in the digital aviation and travel space to daring new heights - are you the one we are looking for? 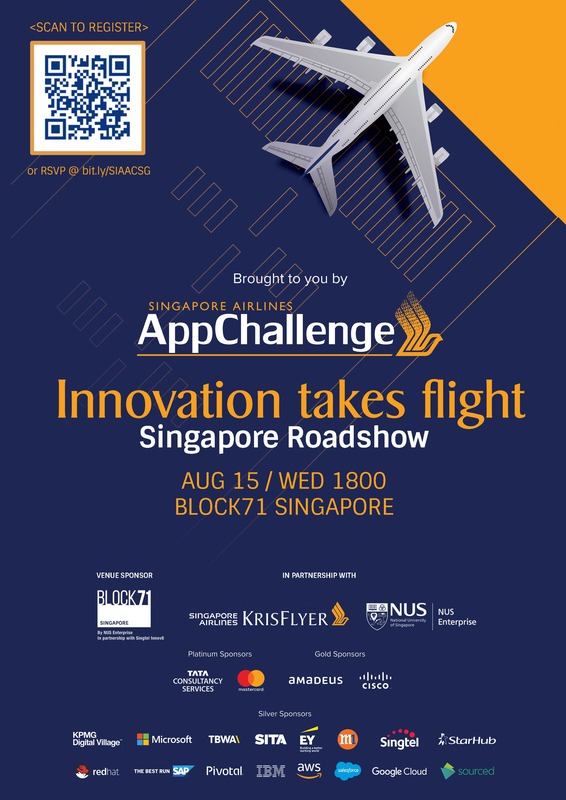 Join the inaugural roadshow of 2018 at BLOCK71 Singapore to get dibs on the reveal of this year's challenge statements, prizes, and connect with industry leaders over dinner and drinks! Kelvin leads the corporate partnerships role in NUS Enterprise and also heads up the Business Development team in Smart Systems Institute (SSI). He is he is also the NUS Enterprise lead for a 4-year old Modern Aging Spore program which was funded by Ministry of Health and has inspired startups in developing innovative services and products for the seniors. In research, he is involved with assistive technologies which could be improve the quality of life for seniors in community settings. Yeoh Siew Hoon is the founder of WIT, launching it in Singapore in 2005 and going on to launch WIT editions across Asia Pacific. In 2016, WIT Europe made its debut in London, days after the Brexit vote. WIT has won several awards including Most Innovative Marketing Initiative and Trade Conference Of The Year from the Singapore Tourism Board and in 2014, Siew Hoon was recognised Tourism Entrepreneur of The Year. A journalist by profession and passion, she's also a speaker and facilitator at events around the world. She's also a published author of titles such as Around Asia In One Hour: Tales of Condoms, Chillies & Curries and children's books such as Adventures of Habibie The Turtle and The Story of Baitong and Boon. Zelia is a traveller and co-founder of surprise trips curator Anywhr, in that order. From weekend getaways to exotic adventures, Anywhr sends travellers to personalised destinations that are usually off the beaten track. Anywhr was started with a vision to help travellers experience the joy of discovery that spontaneous trips bring. Starting her career in the luxury hospitality industry, she eventually became Head of Marketing at a Rocket Internet venture before being half of the founding team at Anywhr. Imran is the Head of Agency Relations at Tech in Asia. Prior to moving the business development team, Imran was Tech in Asia's Branded Content Editor. Previously, he worked in advertising in the Middle East. Imran has moderated several panels, including sessions for Cognizant, Shell, and Startup Thailand amongst others. In his off time, he writes and does improv.